Department of Telecommunications engineering participates in teaching of several bachelor and master study programs at the Faculty of Electrical Engineering of the CTU in Prague, click here for more info. The study is offered both in Czech and English. Most of our educational activities are related to the study program Communication, Multimedia and Electronics – CME, but we are also active in Sofwtare Engineering and Technologies program – SIT (in Czech). Since October 2016 we will provide education in the new study program Electronics and Communications – EC in Czech). The goal is to educate graduates with the skills to solve problems in the field of information systems and electronic communication networks, creating wide abilities to work at research, design, production and maintenance of all types of communication systems. For our students, we provide electronic teaching materials available at CME Moodle platform. 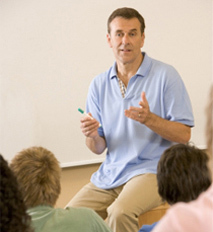 Some demonstration teaching modules are available. Department of Telecommunications Engineering provides education in the field of Telecommunication Engineering in the study program in Electrical Engineering and Computer Science. We offer the following dissertation topics. Detailed information on doctoral studies can be found at the Faculty website. The classes are held in our laboratories. Projects for foreign students can be found here.